Within the clustered protocadherin families, functional data have as yet only been reported for the y-Pcdhs. Regarding the Pcdh-P locus, the lack of a shared constant domain has likely been a hindrance to both expression studies and the design of gene knockout strategies. Of all the protocadherins, the a-Pcdhs have been the most intensively studied, and we have a good deal of information about their molecular evolution, gene expression, protein localization, and adhesive interactions, due in large part to the efforts of Takeshi Yagi and colleagues19,22-24,35,41-44,49-51. Genetic analyses of the Pcdh-acluster remain unreported as of this writing, though it seems likely that results of such experiments are imminent. In this regard, it is interesting that a 16.7-kilobase deletion in the human Pcdh-a locus that truncates one isoform and removes two others causes no obvious abnormalities in individuals from several populations52. This suggests that strategies similar to those pursued for the Pcdh- ylocus, in which multiple isoforms are mutated, may be required to obtain detectable phenotypes. As for the y-Pcdhs, several aspects of the mutant phenotypes remain to be examined in detail, and there are many unanswered questions, three of which I discuss here. First, why are only specific neuronal types affected? In the Pcdh-ydeletion mice, only interneurons in the spinal cord, and a subset of neurons in the brain, undergo excessive apoptosis. Major projection neuron populations, such as sensory neurons of the dorsal root ganglia and motor neurons of the ventral spinal cord, appear to be spared, although there could be subtle alterations in their synaptic connectivity9,10. The ubiquitous neuronal expression of the Pcdh-y genes makes this specificity difficult to understand. A clue may be found in the fact that spinal interneurons only become affected late in their development, once they have migrated and begun to make synaptic connections. If y-Pcdh function only becomes critical as neurons mature, the lack of obvious defects in neurons, such as those in the forebrain, that are relatively immature at the time the mutant neonates die would not be surprising. A timing difference, however, cannot explain why sensory and motor neurons appear spared in the spinal cord, as these neurons develop very early. Thus, some of the specificity of phenotype between neuronal populations likely reflects deeper differences in the repertoire of Pcdh-ygenes they express, or in the presence or absence of (as yet unidentified) associated signaling partners. Our current work is aimed at clearing up this issue by using conditional mutants to disrupt y-Pcdh function in isolated neuronal subsets and/or at different stages of development. Second, for which stages of synapse development are the y-Pcdhs required? Most of our results support a role for y-Pcdh function in synaptic maturation and/or maintenance rather than initial synaptogenesis. However, a time-course analysis of synapse development in mutant neurons compared to that of control neurons will be necessary before this can be determined. Also important to clarify in this regard are the dynamics of y-Pcdh protein localization at the synapse. The substantial extrasynaptic localization of y-Pcdhs and their presence in axonal and dendritic tubulovesicular compartments10,45 suggest that they are shuttled to and from synapses, and the regulation of such trafficking might be coordinated with synaptic maturation. It is also entirely possible that y-Pcdhs exert their functions through intracellular signaling partners, and thus influence synapse development "at a distance" rather than being exclusively involved in adhesion across the synaptic cleft. Third, are y-Pcdhs involved in specifying the pattern of synaptic connections? The phenotype of Pcdh-y mutant mice is certainly not inconsistent with such a notion, as synapses that form between "incorrect" partners are likely to be smaller, weaker, and less stable than those found in the "correct" circuit (see references in ref. 9). However, the existing data cannot exclude the possibility that y-Pcdhs are important for more "generic" synaptic functions and that individual Pcdh-y genes are, to some extent, interchangeable. The differential and combinatorial expression of Pcdh- Yisoforms is, however, highly suggestive of a role in synaptic specificity, and the idea is so attractive that it is likely to remain the default assumption. Conclusive data in support of this will probably require the development of new knockout and transgenic mouse lines in which the repertoire of Pcdh-y genes is altered. Correlating the expression of particular isoforms to neuronal subsets for which the pattern of connectivity is known may also help us to answer this question, particularly if misexpression of another isoform can be shown to shift such connectivity in an observable way (for an example of such an approach, see ref. 1). A corollary to this question is whether apoptosis in Pcdh-ymutants is a consequence of inappropriate synapse formation or is due to a separate role of y-Pcdhs. 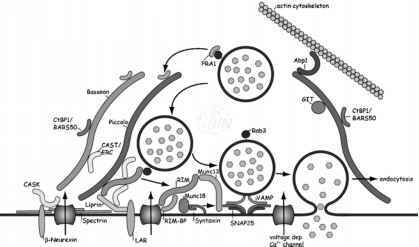 In parallel to neurobiological studies of protocadherin function at the synapse, it will be important to address mechanisms of intracellular signaling. The CNR genes (Pcdh-a members) were initially isolated in a yeast two-hybrid screen for binding partners of Fyn19, a multifunctional tyrosine kinase that has been implicated in neuronal and glial biology53,54. Mice lacking Fyn display several neurological abnormalities that could reflect disrupted signaling downstream of a-Pcdhs55,56. Interestingly, although the organization of the Pcdh-yC exons is very similar to those of the Pcdh-a cluster, there is little amino acid homology between the domains they encode, and the y-Pcdh C-terminus lacks the multiple SH3-binding motifs through which the a-Pcdhs likely interact with Fyn8. The signaling partners that may be activated by y-Pcdhs are, therefore, unclear, as are those that might interact with the constant domain-lacking P-Pcdhs. Three recent reports have begun to shed some light on the issue of y-Pcdh signaling. Gayet et al.57 performed a yeast two-hybrid screen for proteins that interacted with the V exon-encoded portion of the y-Pcdh B1 cytoplasmic domain. This screen identified the stathmin homolog SCG10, which has been implicated as a microtubule destabilizing protein58. GST pull-down and co-immunoprecipitation experiments confirmed this interaction, and further suggested that SCG10 can interact with two other "B" subfamily y-Pcdh isoforms, but not with the divergent C4 isoform57. While such an interaction is intriguing, it is not yet clear whether it is of functional significance in vivo. Also unknown are the proteins that may interact with the constant cytoplasmic domain that is shared by all 22 y-Pcdh isoforms. Two similar reports have, however, suggested that this domain can undergo presenilin-dependent cleavage followed by translocation to the nucleus59,60. In HEK293 or COS cells transiently or stably overexpressing individual Pcdh-y cDNAs, it was found that the y-Pcdh ectodomain was cleaved at the cell surface, and that this cleavage could be blocked by inhibitors of matrix metalloproteinases. A second cleavage event near the cytoplasmic face of the membrane released an approximately 20 kDa C-terminal fragment that was found to localize to the nucleus. This C-terminal cleavage event was carried out by presenilin, as it was blocked by specific inhibitors and was absent in fibroblasts cultured from mice lacking both presenilin genes59,60. Using a luciferase reporter assay in transfected HEK293 cells, Hambsch et al.59 present evidence that nuclear translocation of the y-Pcdh intracellular domain can lead to transactivation of Pcdh- yV exon promoter regions. Surprisingly, such transactivation did not depend on the "conserved sequence element" that was shown previously to be required for Pcdh-y expression31,32. Because these experiments were conducted using non-neuronal cell lines overexpressing exogenous constructs, the relevance of these mechanisms to neuronal development in vivo is not entirely clear. In support of such relevance, Hambsch et al. show that mice in which the first Pcdh-yC exon has been deleted express very low levels of y-Pcdhs59, a situation similar to that in the Pcdh-y truncation line that we have described9. However they might work in developing neurons, the mechanisms discovered by Hambsch et al. and Haas et al.59,60 are remarkably similar to those that result in the processing of A-cadherin (reviewed in ref. 61). These recent data suggest that y-Pcdhs could influence synapse development "indirectly" via intracellular signaling pathways in addition to their presumed "direct" role in adhesion across the synaptic cleft. Further work toward identifying protocadherin signaling mechanisms should greatly enhance our understanding of the roles played by these molecules in the development of the nervous system.